ONLINE STATUS - Site Continues to be upgraded, apologies for any inconviniences. 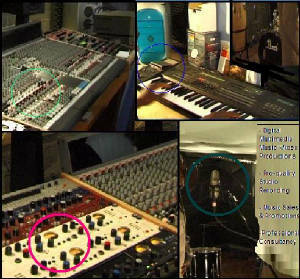 Traxbox Amspug offers pro-quality digital studio production services at unbeatable rates to a wide variety of customers. From small one-off song demos, to full albums and videos, detailed to specific customer as well as original proprietory tastes. Our state-of-the-art top-brands, versatile digital MIDI studio set-up and long-time hands-on expertise ensures the best products for all our clients - be it the single musician , 4-plus member bands, or indeed full ensembles, commercial corporate bodies. Need any of the following services, just give us a call for the best offers. OUR PROMISE -SERIOUS SAVINGS WITHOUT LOSING THE EDGE . LET YOUR TALENT SHINE!.